Each year, the Harlem Globetrotters descend upon Wildwoods at the Jersey Shore for a week of basketball madness. 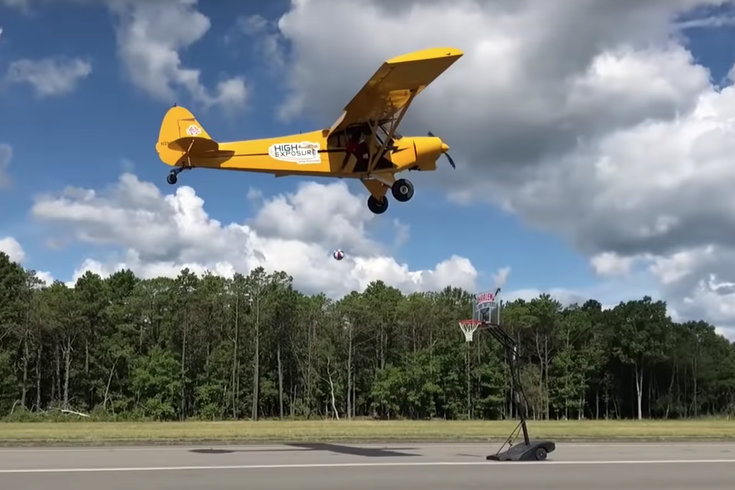 Before this year’s games, the team’s William “Bull” Bullard decided to make a bit of Globetrotters history: he became the first team member to attempt a shot from an airplane since the Globetrotters started doing Globetrotter things in 1926. According to a release from the Globetrotters, the monoplane was flown by a pilot from High Exposure Aerial Advertising, the company that flies many of the banner planes at the Jersey Shore. Probably the best view in the video above comes at 1:31, from the side. Look how far away Bullard has to release the ball! Not even Steph Curry is draining it from that distance. That angle is very good. The Globetrotters will play four games and host four clinics at the Wildwoods Convention Center from Wednesday, August 15 through Saturday, August 18. The team’s full schedule, and tickets, are available at www.HarlemGlobetrotters.com.